Would like to change background color of drop down menu's, i.e., Windows Explorer menu's, Google Chrome Browser drop down menu's, etc. Google Chrome's drop down menus cannot be changed, they are forced by Google Chrome itself to be the color they area. What about drop down menus for Windows Explorer, etc. Need to use Skinstudios. Change in the "Change Skin Colours" and "Edit Menus and Menubars" Depand on OS. I opened Skinstudios (Windows 7 Pro 64) and navigated to 'Change Skin Colours, however, there is no 'Edit Menus and Menubars'. You will need to dig a little deeper. But if you on Windows 7 need to do it on the "Edit Menus and Menubars" path. Can't change the color need to change the image. Edit controls -> Edit menus and Menubars -> Background. Change that image. Appreciate the quick response and assistance. I navigated to Edit Controls -> Edit menus and Menubars -> Background and was able to successfully modify the image, however, when I modify the 'Disabled' Menu Item text, nothing is changed. Please see attachments. Not sure what item needs to be modified to change the menu item text color to something without the 'shadow' affect. Please try all the setting available. I can't walk thru all the setting with you. The best way to learn is making mistake and discovering new things. Already did that. Nothing ever changes for the 'disabled' menu item. 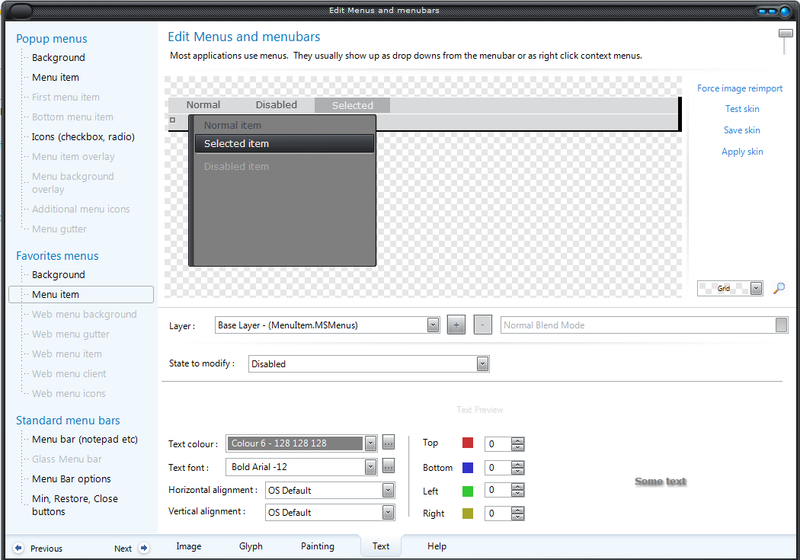 Edit Controls -> Edit menus and Menubars ->Menu Item. There are 2 Menu items below the "Background", change the disabled text in both Menu items. Just use the drop down menu after the "Text Color"
what ever color it's showing now change it to White for now so you know you see the change. Don't forget to click "Apply" with every change. I don't know what WB you are using to try and actually make changes to it here for you. Saying this however it shouldn't matter as the correct area is listed here. Appreciate the assistance. Your second post was helpful in that you noted there were two 'Menu Item' sections to change. I was able to eliminate the 'fuzziness' of the 'disabled' menu item by going to Edit Controls -> Edit menus and Menubars ->Menu Item (first 'Menu Item' on left pane) -> Extra Settings Tab (at bottom of window) and enable 3D Effect for Menu Items. Seems to me it should be the opposite to remove 'fuzziness', however, I don't want to complain as it works. If only these changes would effect drop down menu's in Google Chrome, I'd be set. 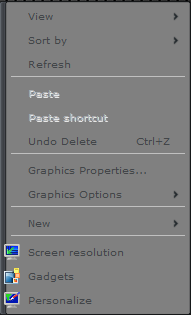 Extra Settings Tab (at bottom of window) and enable 3D Effect for Menu Items. Seems to me it should be the opposite to remove 'fuzziness', however, I don't want to complain as it works. Go in there again and read what it says. It doesn't say "enable" it says "disable" So that is why it you check it and it works. sorry didn't know you were asking for that or would have told you so you could save time. It says 'disable' now that I have it 'enabled'. I read it right. I also did indirectly state that it was the 'fuzziness' or 3D effect of the text by attaching images in a previous post.